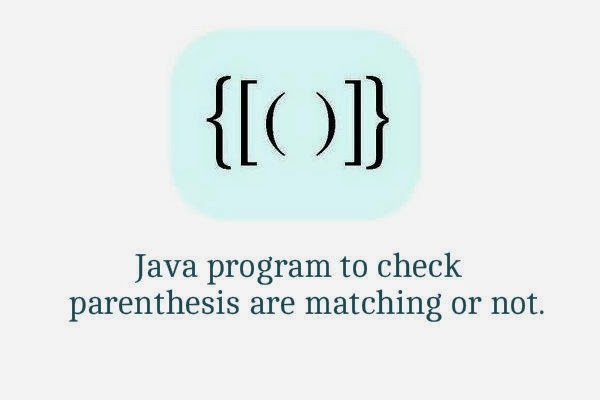 Java program to check parenthesis are matching or not. Objective: To test whether the input string of a parenthesis is matching or not i.e. we will print output as MATCHING when every opening braces have a matching closing braces . 1. Take a input string. 2. Traverse the String starting from index '0' to (length-1). 3. Check if the element encountered during traversing is opening braces ? if yes, push that element into stack. Pop an element from stack and check if the popped element is the corresponding opening braces, if no return false. If yes, do nothing (loop continue). 5.After completion of traversal check if the stack isEmpty() or not? If yes, return true, else return false. DOWNLOAD THE ABOVE PROGRAM BY CLICKING HERE.